When it comes to dog walking, Sherborn provides dog owners with access to the best walkers around at Doggy Dates. Started in 2011, our business strives to help pet owners provide the very best for their dogs on a daily basis. We are providing dog socialization and exercise dates, over night boarding care, and training to keep your furry companion feeling great. As a bonded and insured company, each of our qualified, reliable caretakers is ready to start providing exceptional care and dog walking in Sherborn for your dogs throughout the year. Let us know what you need on an as-needed or routine basis, and we’ll take care of the rest. All new clients can try out our services for dog walking in Sherborn for free! Sign up today. At Doggy Dates, we believe that passion is vital in any animal-handling business. Our team is passionate about the health and well being of dogs. We come from a variety of backgrounds, but all of our administrative staff and dog care personnel share one thing in common – we love dogs! Many of us grew up with dogs and have experience dog walking in Sherborn. Our resident dog trainer uses positive reinforcement to give exuberant pooches a firm, but supportive guiding hand. Whether we take your dog out for a few hours here and there as a dog walker in Sherborn or we provide extended, long time care and/or training services, you can trust that our reliable, professional team will treat your dog like part of our family. We follow a set of best practices from separating dogs in car rides to taking your dog to the vet for emergency care (if needed) that will make you feel comfortable relying on us when you need a break. As your premier professional local dog walker in Sherborn, we promise to make your experience with doggie day care great. Play groups. While we can provide single dog playdates for dogs who need an occasional dog walker, many of our clients take advantage of our five-days-a-week playdate program. We offer an early morning, midmorning, and early afternoon group. A trained dog walker in Sherborn will pick up your pooch in our Doggy Dates-branded Scion XB and chaufer him or her to our acre of private farmland for social interaction and play. We only accept friendly, socialized dogs in our playdates to keep our dogs safe and provide peace of mind. Overnight stays. When you need more than a few hours here or there, we offer weekday and weekend through the night stays. Unlike other doggie daycare programs, the dogs we care for stay in the homes of our professionals. They have free run of the house and can relax as one of the family while you’re gone. We never host more than a few dogs in a home at one time and never leave our guests unattended for more than a few hours. 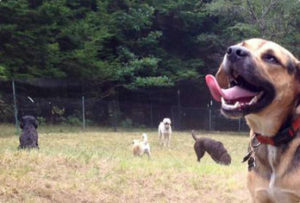 At Doggy Dates, we’re so much more than your average dog walker in Sherborn. If you’re searching for a trainer, we can incorporate one-on-one training sessions into your service profile. Our resident trainer specializes in all routine problem behaviors including pulling, jumping, barking, and poor recall (not listening). As your resident trainer and dog walker in Sherborn, we strive to fulfill every dog’s need for structure and exercise. For non-dog-aggressive pets, we also provide socialization in a group setting to instill courteous playtime behaviors. Whichever service for dog walking in Sherborn you choose, we know you’ll appreciate our attention to detail and flexible, convenient pickup and drop-off arrangements. Find Dog Walking Jobs in Sherborn! As you explore dog walking opportunities in Sherborn, consider the benefits of our alternative business arrangement. Here, you will probably not work in an office and you have one priority – to care for doggy clients as their own owners do. Host fun-loving, active pooches in your own home, stay in someone else’s, or supervise dog playdates from start to finish. Each of our positions offers its own rewarding experience with dogs of all breeds and personalities. Sound great? Tell us why you’d fit right in with our culture and mission. Call us at the number below today! Whether you’re searching for dog walking jobs in Sherborn or you’re interested in our services for dog walking in Sherborn, we know you’ll find what you’re looking for when you partner with Doggy Dates. We’re making it our mission to bring affordable, trusted, high-quality dog care to your doorstep year round. With a great private play area for active, pickup and drop-off services, and a focus on flexibility, we look forward to showing you why our business model is the best and most trusted in all of Metrowest Boston. The next time your dog bounces off the walls with energy or you need a break from the routine, entrust your pet to the hands of professionals who specialize in dog care. Give your dog the freedom run to his/her heart’s content, socialize with other friendly dogs, and come home ready to snuggle and behave. With a free trial opportunity, we hope you’ll take us up on our offer and see why more residents prefer our team for dog walking. Sherborn residents who want to learn more can always reach our team on the phone at (781) 801-2526.